This spacious 4 Bedroom, 4.5 bath home with hot tub is located in the heart of Harbour Town.This spacious 4 Bedroom, 4.5 bath home with hot tub is in the heart of Harbour Town. Walk or bike to Harbour Town where you can shop, dine, or golf at the famed Harbour Town Golf Links. Upon entering the home, you will find a large open living area that encompasses the kitchen, dining area and living room. The fully equipped kitchen includes a freestanding ice maker and breakfast bar that seats 6. The open floor plan leads you to a large screened porch with a hot tub and a mounted flat screen TV with DVD player. Also located on this level, you’ll find the 1st master bedroom with king bedding and private bath. On the 2nd floor, you’ll find 3 more bedrooms with private baths. The 2nd floor master suite furnished with king bedding has a private balcony. The next bedroom's furnishings are a queen bedding and a set of bunk beds. The last bedroom contains a king bed and a full sleeper sofa. This home has so much to offer; you won't want to leave! Great house, great location, loved it! We loved this house, the layout is great, it’s clean and has almost everything you could ask for in a rental. The coffee pot doesn’t shut off and the tv sometimes made an annoying buzzing noise. Other than that this house is a ten, location, amenities, who could ask for anything more??? We are delighted to hear that you enjoyed your recent visit to Hilton Head and greatly appreciate your feedback. This is a beautiful rental home and we are pleased to hear you enjoyed it as well as its location and amenities. As for the coffee pot and TV we will be sure to pass these remarks along to the property manager to assess. We hope you plan to visit Hilton Head again soon and would be happy to assist with any future rental needs you may have. My family has been coming to HHI, Sea Pines for 30+ years. This was our first time booking with The Vacation Company. This experience, by far, was our most favorite. We had three generations living in the house. The house was large enough to give us "our space". The house is as described on this site - very clean; lots of amenities; current appliances in working order; large kitchen space and sitting area for hanging out; enjoyed using the gas grill; a few walking minutes to Harbour Town, "Gregg Russell", the swimming pool, and the Sea Pines shuttle. The access to the bike trails and bike rides to the Monarch Beach and South Beach were a favorite. The Vacation Company staff was very friendly and responsive. We are looking forward to next year! Our extended family (ranging from age 2 - 65) stayed at this home the week including the 4th of July and it could not have been better. This property was very clean, nice appliances, beds, bathrooms, etc. We have stayed in the Harbour Town area many times and I'd put this home near if not at the top of our list. Being able to walk to Harbour Town in the evenings is a big plus and our family enjoyed the Harbour Town pool as usual. The property management company was great to work with as well. Upon our arrival, we learned that our entry would be slightly delayed (20 minutes) because the cleaning staff and other property management people were working feverishly to clean the residence, replace a couple mattresses, etc. after the previous renters had made a mess, damaged some things, etc. We were impressed how quickly everything was addressed by the rental company which made our vacation extremely enjoyable and stress free! We would highly recommend this property for a big family, couples, etc. who want to enjoy Sea Pines, Harbour Town, and everything HHI has to offer. The pictures don't show this house off as it's designed. It's in a close proximity to other houses (which you can't see) but on the end of the block so it's not loud or noisy with neighbors. The layout is incredible with plenty of room to move around. The kids rooms were upstairs and far enough away from the parents room (downstairs and away from the stairwell) that we couldn't hear a thing. The hot tub is close enough to get to and still be around everyone downstairs in the kitchen/living room. The second master suite was beautiful upstairs with it's own balcony and the other rooms were tastefully laid out. We rented this home to care for two adults and 4 teenage children and far surpassed our needs and gave us our wants (privacy). Tastefully decorated as well. 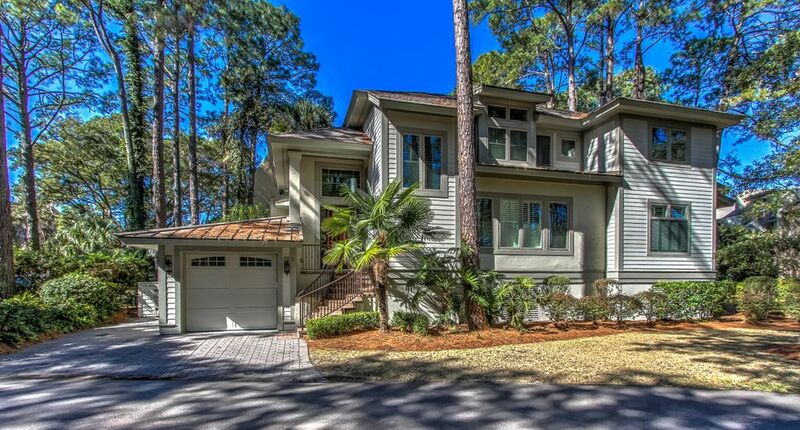 Perfect location on Hilton Head, short walk or bike ride to Harbour Town. House had everything a person could ask for, except parking for three vehicles. Six of us have been coming to Hilton head for about fifteen years and would put 2 Genoa in the top three of the places we have stayed. If you need 4 bedrooms with separate baths don't pass this house. Except for the last week in April when we may need it.